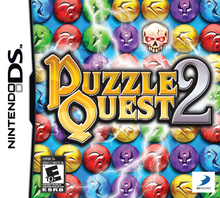 Note: Copy any of the above Puzzle Quest 2 (USA) rom download links and paste it into your browser to download. looks like all versions have a cracktro. could you upload a clean dump please? open the ROM in a hex editor change the byte at address 1D29CF from 1A to EA. That should make the intro vanish. I got a problem with my R4i with DS Light and Kernel 1.57. The litte monkey scene is ok but the game doesn't begin.